PageWide Technology offers consistent, reliable prints. Antifraud technology ensures top-notch quality. Smear- and water-resistant formula helps guard against smudges and moisture. Easy-open packaging lets you replace the cartridge quickly. Print professional-quality color documents for a lower cost per page than standard cartridges1 and get outstanding results every time with high-yield cartridges designed and engineered for HP PageWide Enterprise devices. 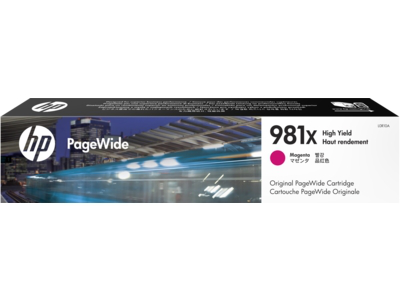 1 Based on ISO 24711 cartridge yields for HP 981 series High Yield Original PageWide Cartridges compared with HP 981 series Original PageWide Cartridges. Learn more at http://www.hp.com/go/learnaboutsupplies. 2 HP Web Jetadmin is available for download at no additional charge at http://www.hp.com/go/webjetadmin. 3 Tested in HP PageWide Enterprise Color MFP 586dn. Average continuous composite (cyan/magenta/yellow) yield based on ISO/IEC 24711 or HP testing methodology and continuous printing. Actual yield varies considerably based on content of printed pages and other factors. For details see www.hp.com/go/learnaboutsupplies.